Exclusive use,secluded Hilltop Farmhouse 2 Bedrooms 2 Bathrooms Sleeps 4. Our hilltop farmhouse, for your exclusive and private use, is in a small hamlet set high up amongst fields and woods, with wonderful views and a 'big' sky.It has been lovingly restored, offering an attractive and generously equipped interior, prepared by the American owners. The pool has a sun deck and wonderful views. We are very popular with couples who want a private home to unwind in, after busy marriage celebrations and/or working life. With many stairs and open areas, the property is generally not suitable for children; babies are welcome! The nearest big villages are St. Severin and Verteillac. 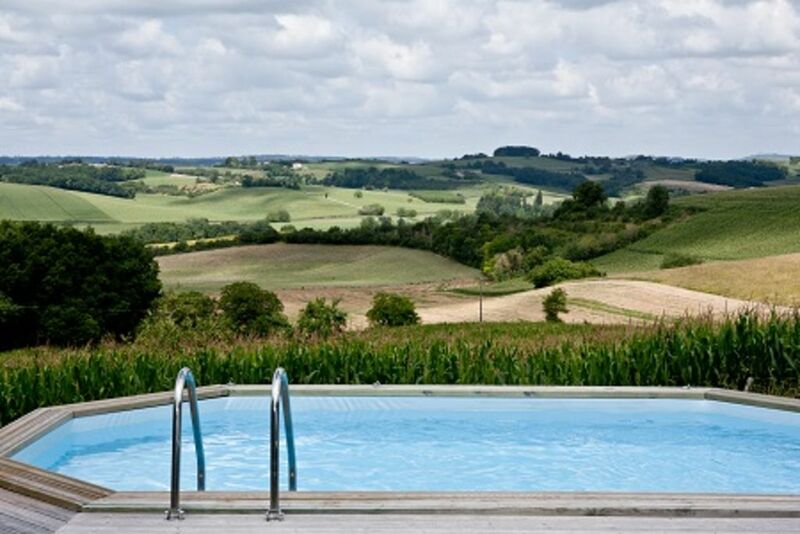 The surrounding countryside is full of history and offers many leisure facilities, including wonderful canoeing on the River Dronne, tennis and riding. Strolling along country lanes, with fantastic views, is recommended, two good quality bikes are also provided. The exterior of La Croix farmhouse reflects its long history, blending well into the other few buildings in the hamlet. The large courtyard is sheltered by the ancient barn, the garden opens onto the wonderful views, pool and its sundeck. The house is on three floors. The double bedroom, twin bedroom and separate fully fitted bathroom. This is a conversion from the old granary and there are some low ceilings and doorways. The large, very light well proportioned salon has a window and three glazed doors, the front door to the lane, rear door to a landing with stairs to the courtyard and doors to the large balcony room. The kitchen has a work island with solid wood chopping board, fridge and dishwasher. The pots, pans, food processor, knives and utensils are mostly imported from America and of a very good quality and reflect the fact that the American owners love to buy the excellent local produce and cook. The cooker has 5 burners and an electric grill inset in the gas oven. The table comfortably seats 6 or you can eat on the sheltered furnished balcony, or down on the ancient stone table in the courtyard, or under the old walnut tree. The large leather sofa and adjacent leather chair encourage relaxing, reading one of the many paperbacks provided, or watching the TV, which has English free channels. There is also WIFI. The sitting end of the salon opens onto the large, furnished balcony, where meals may also be taken at the table or seated on the very comfortable futon sofa. The view from here is magnificent. A large utility room with washing and drying machines, large sink, second fridge freezer and direct access to the courtyard, through barn type doors. Storage space for the two good quality bicycles. Shaded parking under the balcony. A shower and separate toilet accessed directly from the courtyard. There is a stone table and gas BBQ. There are several parasols, cushions, chairs and sun loungers for you to arrange as you wish and further shade under the lovely huge walnut tree. Further down the garden, past the barn, the pool and sundeck offer the chance for a cooling dip and to sunbathe and enjoy the view. Please contact us if you require further information and extracts from the house book. You may e mail or phone and we will arrange to call you back at our expense. We will aim to provide you with a clean, bright and beautiful home for your all important holiday and we ask that you take care of this lovely old house. ‘Thank you for sharing your sanctuary from the stresses of the work a day world! It’s charming, comfortable, interesting and quiet.’ B and D.
‘The house has been fantastic, with such wonderful surroundings, and excellent cookware. I’m sure we’ll be back. This is undoubtedly the best house we’ve stayed at in France.’ H and C.
‘It’s a beautiful house, thoughtfully kitted out in a stunning location, with views to die for.’ P and C and baby. ‘Thank you for making our week so wonderful. The place is gorgeous and in such glorious countryside. The view from the balcony is very special and we’ve enjoyed ending days just watching the sky and its changes.’ J an J. ‘The highlight was yesterday, when we were in the pool and the swallows were swooping in for a drink and suddenly a deer ran by!’ A and A. The upstairs bathroom, between the two bedrooms has a toilet and bath with hand held shower fitting. It is a lovely room, but with very low ceilings except by the toilet and basin. Please see photos. At ground level there is a simple full height shower and separate toilet opening onto the courtyard. All linen and towels are provided, including pool towels. fans provided in bedrooms and living area. Good quality linen. A change of linen provided for two week stays. Covered open parking available for one car under the covered balcony. A pool with a view to die for! The house and grounds at La Croix are entirely for your use. We do not live on site, but 20 min away. There is a house book with useful information and we are very willing to meet with you after you have settled in to help you quickly get to know the area. We will be available if you need us and/or leave you to enjoy La Croix's special tranquil atmosphere. There is a phone for incoming calls and outgoing use by arrangement. In order to prepare the house for the next guests we ask that you leave by 10 am on departure day. Arrivals should be after 4 pm. The cottage/gite, the location, the views, the contents/equipment just perfect. Yes so the ceilings are a bit low upstairs but we never bumped our heads once. Made good use of pool, boules and kitchen. So much more that we just never had time for. Helen, the lovely property manager, gave us a quick visit to ensure we'd settled in and to reassure us she was available at all times should we need her. So many lovely villages to explore, Brantome, Aubeterre-sur-Dronne - Verteillac, the nearest, was handy for butchers, patisserie and small supermarket as well as a couple of cafe/bars and bank. The 'brocante' held in Verteillac on the first Sunday of the month is well worth a visit. Overall we can't praise the cottage and location enough - desperate to go back. Thank you so much, Fiona and Tony, for your lovely review. We always try so hard to look after our guests and positively act on any feedback they give us. We are so happy you had such a lovely time at La Croix, and we will look forward to welcoming you back at some point in the future. We had a wonderful two weeks at this lovely property. Two couples, and we were constantly pleasantly surprised by the facilities. Loved the views, beams, mattresses, sheets, kitchen knives, and so many other things! Great area with so much to see and do. We didn’t do a huge amount though as we were lazing by the pool most of the time! We were very pleased we chose the gîte and intend to return in the future! Thank you very much for your kind review. We try our best to make sure that our guests really enjoy their stay, and so pleased that you enjoyed your holiday in our beautiful property. We look forward to welcoming you back in the future. Lovely local area and peaceful setting but inaccurate description of facilities. Having read the previous reviews we would agree with everything said about the local area. The peace and tranquility offered by the house is second to none. I have scored a 3* when I would have preferred a 2.5*. Two of the main requirements for us when selecting a property was aircon and a walk in shower. Regretfully there was no aircon only a small mobile unit that was not useable as the venting pipe was missing. Being a barn conversion the bedrooms were high with no ventilation and became unbearable in the heat. The walk in shower was a concrete outbuilding too small to dry in. Being isolated drying outside ‘al fresco’ wasn’t an issue so long as it didn’t rain! Being rural we expect spiders etc but this had to be cleaned daily before the ladies would use it. I feel the description is not accurate and appears to offer facilities not present. Maybe small issues but ones that would have led us to a difference venue had the write been accurate. Under the facilities section in the advertising description, it clearly states under aircon that there is a fan. Fans are provided in both bedrooms and the living area for our clients’ comfort. Due to the excessive heatwave we have been experiencing this summer, the owners provided a cooler at the ground level. This is a cooler fan, not an aircon unit. So that means that it blows out cold air. It does not, however, reduce the room temperature. Had you made a request for additional fans, they would have been provided. At no time during the booking process did you state that a key factor for booking was aircon. I acknowledge that you experienced excessively high temperatures during your stay, which is not normal weather in this part of France, and is totally outwith our control. The advertising description clearly states that at ground level there is a simple full height shower and separate toilet opening onto the courtyard. There is an closed area directly next to the shower which is perfectly adequate to dry oneself. Our property is a self catering gite in a rural location. It was spotlessly clean for your arrival. We have no jurisdiction over the local spider wildlife. We do provide insect barrier sprays for our clients' use. We believe our description is accurate, and pride ourselves on offering excellent value and information to our clients. We have just returned from our holiday and spent a week at La Croix. This property can only be described as a beautiful old country house in the heart of the beautiful Charantaise countryside positioned down a country lane in a little hamlet, but standing on its own and totally private. The views are stunning from the garden and the pool has been positioned to maximise the views when you are in it. It is so quite and peaceful and the house itself has been lovingly restored to a high standard ,retaining its traditional charm with exposed stone walls and beams, while at the same time being equipped with everything you would need in a home and for your holiday. Everything has been thought of to make your stay as comfortable as possible. We enjoyed a great holiday in this lovely house in a stunning location and would definitely recommend this property for a quality relaxing break, you would struggle to find a better location. Thank you for your kind review. We thoroughly enjoyed having you as our guests, and so pleased you had a good stay. We look forward to seeing you again at some point in the future. We stayed for 10 days here in the middle of a extensive road trip around France and the view never got boaring. If you are looking to escape from the huddle and bustle of life this is the perfect place to stay. The house is really well equipped with everything you will ever need. It feels very french and oozes character. We enjoyed using the BBQ and looking out at the beautiful view every day. The pool was a welcome addition given the really hot weather we experienced. There is everything you need close by in Vertilac including a wonder passiserie and charcuterie. The only negative in the head room up stairs which we both fell victim to in the first very days but it is certainly not a reason not to stay here. We would highly recommend this place. Perfect 'get away from it all' holiday destination! If you want a holiday that is as far removed as possible from the fast pace of every day life, this has to be it. Equally, if you want to see a 'real' piece of genuine France, this is it. The accommodation is first class and equipped above and beyond what you normally get in a holiday property. It did feel like a home from home. The location is perfect. You can genuinely live like a 'local' and the view (and the changing skies and sunsets) are breathtaking. We really wouldn't hesitate to recommend this property to family and friends and would definitely consider going back for a return stay which is something we rarely choose to do. If anything, the website doesn't do it justice - it's even better than these amazing images show. If you do decide to book La Croix we hope you have just as brilliant a time as we did. The perfect escape from the real world for a fortnight! Thank you, Dawn and Ian! So pleased you had a lovely time in our beautiful property, and hope to welcome you back again in the future. This is rural France, perfect for walkers and ramblers, cyclists, artists and those wishing to explore the region by car or bike. The tiny hamlet of La Croix, is situated high on a hilltop in the commune of Bouteilles St Sebastien, in the Perigord Vert. It is to the South of Angouleme and North West of Perigueux. The nearest villages are St.Severin, (10 mins), just over the border in the Charente and Verteillac (10 mins) in the Dordogne. The thriving, popular market town of Riberac is 20 min away to the south, en route to Perigueux. The ports of Le Havre St. Malo and Caen are now an easy, fast drive, on modern autoroutes. Bergerac (1 h.) is the nearest airport, Bordeaux (1h.30) is a little further, but your journey could include a visit to this wonderful city. Both have car hire. Angouleme station is some 40 min away, with very fast TGV trains to/from Paris and car hire offices. Surrounded by farmland, La Croix sits on a ridge overlooking a beautiful valley. The view is predominately undulating meadows with mixed fields of corn and sunflowers. A quiet lane leads to the property, which is set amongst a few other homes in the hamlet of La Croix, in the commune of Bouteilles St. Sebastien. The region is well known for its antiquities, art, Romanesque architecture and of course its cuisine. In addition to the wine and cognac, foods include foie gras, walnuts, strawberries, truffles, pates and cheeses. There are many attractive restaurants in the area. Over the border in the Charente is the beautiful medieval village of Aubeterre sur Dronne (25mins), famous for its monolithic underground church. The tree-lined square is full of cafes and quirky shops, perfect for browsing. There is also a river beach, kayaking and many other tourist attractions. There is a good 9-hole golf course nearby. The Grand Etang at La Jemaye is a lovely place to visit for those with children; a sheltered lake (with lifeguard) on a lovely sandy beach surrounded by pine trees. This popular pôle loisirs also offers a playground, fishing area, restaurant, snack bar and graded fitness trails. Brantôme, the ‘Venice of the Périgord’, is just 40 mins drive away, on the banks of the Drone. A delightfully picturesque town with independent shops, superb restaurants and a wealth of riverside cafés. Guided boat trips run hourly during the summer months and Friday night sees the weekly ‘river joust’ - great fun to watch! The historic cities of Périgueux and Angoulême are both within 40 mins drive. Périgueux, the ‘capital’ of the Dordogne dominated by the magnificent Cathedrale de St Front, offers hidden delights within its winding, cobbled streets. Angoulême is an ancient fortified town, and the world cartoon capital. In September the walled streets are closed for the Circuit des Remparts, the annual vintage car race. The fabulous roman town of St Emilion is a must for wine enthusiasts and gourmets. For those who prefer brandy, the chais of Rémy Martin, Hennessy and Courvoisier are just an hour away at Cognac. With so much to do and see, it’s impossible to list everything here! For additional ideas and visitor information during your stay, you’ll find a wide selection of leaflets and local guides in the property. During the main season bookings are usually taken from Saturday to Saturday. La Croix has the comforts of a proper home, not just a letting property, with a wood burning stove at the kitchen end of the salon and oil fired central heating. You will find La Croix clean and ready for your arrival and a 'changeover' clean is is provided after you leave. All towels including pool towels are provided.